[Adam’s] been to tons of concerts like 12 -13 or more, this was a life long dream of his! He also gave us front row tickets to U2 a few years ago when he had to sit up in the higher seats with his family (because it was his son’s birthday)…it about killed him. 🙂 We are so happy for him! Thanks Bono!! There’s also some interesting conversation in the YouTube comments about how the guitar is being shipped to Adam since it might have been hard to get that guitar out of the arena in one piece. This is kind of troubling to me, because who would steal a guitar from a blind guy, come on? Surely not U2 fans? That said, this great moment reminds me of seeing Kate amaze us during a K’naan show at Metro. And it makes me think more about our visual experiment with St. Vincent , Mastodon and Radiohead, and our Lady Gaga fan-to-artist transformation exploration. Were you there? 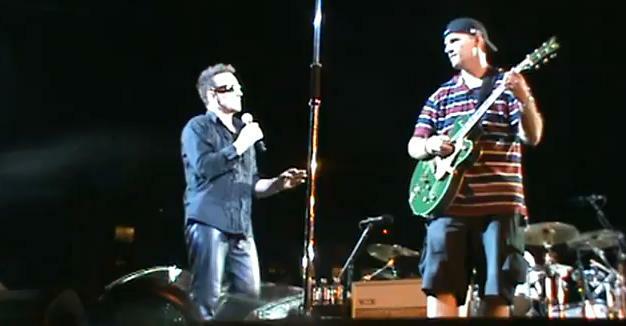 Have you seen U2 live? We invite you to share your concert experiences and thoughts about this show and other U2 concerts in the comments below, so they can be included with other concert fan stories in a future episode of Live Fix Radio.